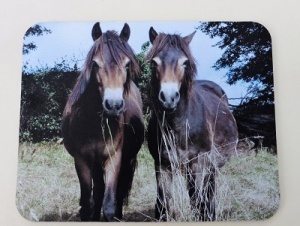 A good quality mousemat with a stain resistant fabric top. Size 19cms x 25cms. Features Pascoe and Hutch when they were yearlings. They are both 6 years old now and Pascoe is at the Centre whilst Hutch is at a conservation grazing site in Sussex. It would make an ideal gift.